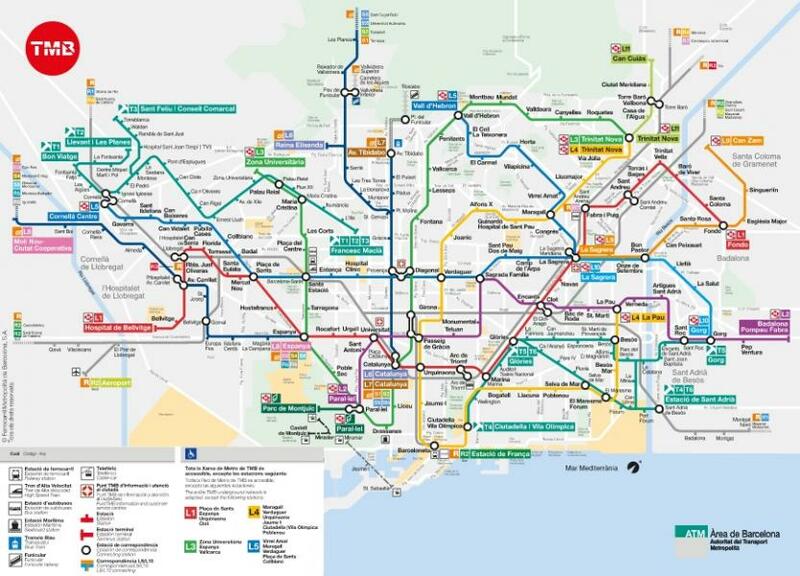 Barcelona has a growing metro network run by TMB, which also runs the city's bus and tram lines. There are currently eight lines- L1, L2, L3, L4, L5, L9, L10, L11. There's a free Barcelona Metro Map app to download. Single metro tickets cost €2.15 and are valid for 120 minutes. A wide variety of passes, are available in the metro ticket machines; certain ones allow you to ride on the buses, trams, FGC and Renfe's Rodalies de Catalunya trains. If you lose something on the metro, ring the information number after 5pm on the day after the loss. Items found will be at the Punt TMB Diagonal information office. After a week items go to the city Lost and Found. Punt TMB Diagonal: Diagonal station. Entrance: Carrer Rosselló - Rambla de Catalunya. Open Mon–Fri 8am–8pm. Punt TMB Sagrada Família: Sagrada Família station. Entrance: Carrer Sardenya. Mon–Fri 7am–9 pm. Punt TMB La Sagrera: La Sagrera station. Entrance: Carrer Hondures. Open Monday to Friday 8am – 8pm. Punt TMB Sants Estació: in the Rodalies de Catalunya lobby. Open** Mon-Fri 7am–9pm. Sat 9am–7pm. Sun and public holidays 9am–2 pm. Punt TMB Universitat: Universitat station. Entrance: Carrer Pelai. Open Mon–Fri 8am –8pm. Hours Sun-Thurs 5am-midnight, Fri and eves of public holidays: 5am-2am; Sat 5am to all night.